The video is courtesy of Loop and the article was published by the Cayman Compass. The stories of their respective journeys may even save your life. The Cayman Heart Fund and the Health Services Authority presented the Heart Survivors Wall on Friday at Cayman Islands Hospital, a tableau of local people who have survived a bout with heart disease. The faces – some men and some women, some young and some old – dot the side walls of the ambulatory section of the hospital. There are already 19 faces of people who have had their lives saved by local health service providers, and room for 41 more survivors as the years progress. The idea is simple, said David Dinner, chairman of the Cayman Heart Fund. It was conceived by Suzy Soto, the chair emeritus of the Heart Fund, as a bookend to the hospital’s Cancer Wall, and the hope is that it will lend itself to improving awareness of heart health among the Cayman populace. “We’ve done a lot of educational programs and a lot of testing,” said Mr. Dinner during his introduction. “We’ve done a lot of … trying to raise awareness of cardiovascular disease in the Cayman Islands. The hospital chose the appropriate holiday, World Heart Day, for the wall’s unveiling. The World Heart Federation founded World Heart Day as a way of driving education about cardiovascular disease, as at least 80 percent of premature deaths from heart disease and stroke can be avoided. For Ian Phillips, 52, the event was personal. Mr. Phillips is one of the heart survivors pictured on the wall, and he said his heart condition was discovered locally but operated on in Miami, Florida. Mr. Phillips needed to take five weeks off work while recovering from heart trouble, and it took him three to four months before he was feeling like himself again. Now he’s back to playing football and serving as a swim official, and he thinks the wall is a nice touch for the local hospital. 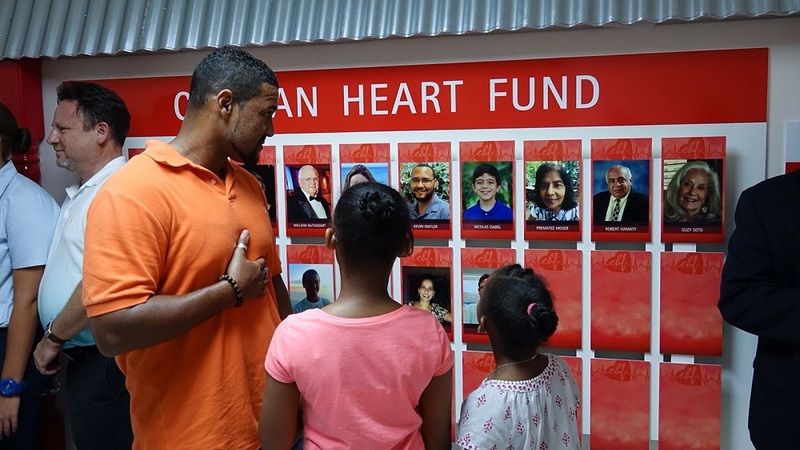 Health Minister Dwayne Seymour attended the unveiling of the Heart Survivors Wall, and he thanked the Cayman Heart Fund for the idea and the Health Services Authority for housing the display. Lizzette Yearwood, the chief executive officer of the Health Services Authority, was also on hand Friday, and she said that heart disease results in more than 17 million deaths per year. That number is expected to rise to 23 million by 2030, but people can fight that increase by taking better care of themselves.